RAL Immersion Oil is a unique high quality, viscous and non-toxic Immersion Oil with a high refractive index and with no residual fluorescence. 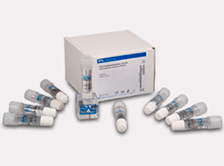 Ranging from 10 ml to 100 ml in volume and with bulk discount packs, these bottles are well suited to use with fluorescent or non- fluorescent microscopes in all fields of work. The unique RAL dropper system is designed for one-handed use, the amount of oil necessary for one glass slide is released by a single easy press. 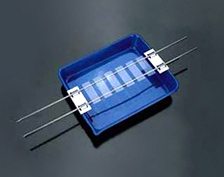 DropSticks® in the RAL Immersion Packs are user-friendly and efficient. The RAL DropStand® rack maintains the dropper bottle ready- for-use, opened and turned upside down. 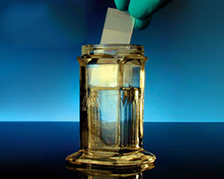 For staining slides, or for use as a developing chamber in thin layer chromatography. Unit holds five single 3” x 1” slides vertically or 10 slides back-to-back. Screw cap is white liner-less polypropylene, which reduces solvent evaporation. Rectangular base. Holds approximately 60ml. Soda-lime glass. Approximate inside dimensions: 26mm L x 26mm W x 90mm. For manual staining procedures. Jars are white plastic with a screw-on top to minimize evaporation. 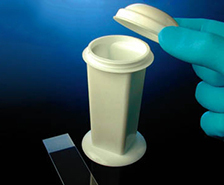 These jars are for use in all staining procedures, with slots on top to eliminate slide contact. Holds 5 slides in an upright position or 10 slides back to back. Spout Caps fit 38mm bottles, these spouts allow a spigot-like action for refilling smaller containers. This stainless steel staining rack is designed for use across laboratory sinks of various sizes. Triangular slide supporting rods have a tapered top, and contact the slides only in a narrow zone. This rack is simple and quickly adjustable to fit sinks up to 53.4cm (21”) inside dimensions.